eCommerce Live – which has been called the Olympics of online (by me), the Ritz of retail (also by me) and the éclair of eCommerce (that one’s just because it’s nearly time for tea) – is a mere two weeks away. The day brings together some of the most forward-thinking minds in retail and digital technology, as they share unmissable advice on UX, the mobile revolution, the Brexit effect and more. We’re not going to lie, you’ll leave inspired to take your digital strategy to the next level with new technologies to give you the competitive edge. Plus, you’ll hear from trail-blazing eCommerce businesses in our live panel debate. Discover how Space48, PushOn and Forever Unique are embracing the digital transformation. 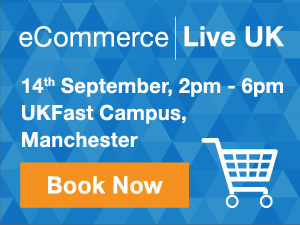 eCommerce Live UK is FREE – don’t miss out on the advice and expert insights! If you want to get involved in the lead-up to the event, find us on Twitter at #eCommerceLive16!